An exclusive excursion taking you around the coast of the island of Ischia, enjoying the sea and sun and flavours of Ischia. A traditional Light Lunch on board is served. The boat will stop at some of the most enchanting coves and bays of the island during the trip. The spectacular areas of the Sorrentine peninsula and the Amalfi Coast are arguably the most stunning locations of the Mediterranean alluring visitors from all over the world, attracted by its sweeping coastline and spectacular views; a once in a lifetime experience. Sorrento is not only a place of breathtaking natural beauty but also boasts points of historic and cultural interest with an array of monuments and churches and unique views, and is part of the UNESCO cultural heritage of worldwide interests. The island of Capri is considered the most famous in the Bay of Naples, attracting visitors to its stunning natural beauty. In Roman times, Capri was a holiday getaway for the Roman emperors, and today, it is a renowned destination for the rich and famous, and also artists, poets, writers and painters, attracted to its unspoilt natural beauty. Ischia on a horseback riding offers a unique excursions along the ancient mule-tracks ascending to the peaks of Mount Epomeo, boasting panoramic views of the island of Ischia. Visitors can experience unforgettable moments in the highest point of Ischia, in a typical and lovely country of the island. Horses were the only animal which could travel the treacherous mule-tracks and they were also used to transport provisions to families living high up in the hillsides and also to transport work materials. Today, horse-riding is the best way to enjoy excursions of the island surrounded by nature. The island, its hillsides, mountains and forests offer the ideal destinations allowing for sport in touch with nature. Ischia, the biggest island in the Gulf of Naples, is enriched with history, art and culture, adorned with historic monuments from ancient churches to typical Mediterranean dwellings, as well as natural landscape and numerous thermal springs. 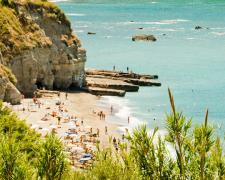 To discover the treasures of Ischia from its bustling towns, sleepy hillside villages and natural landscape and scenery. The tour includes short stops at some of the most renowned spots of the island, vineyards, botanical gardens, spa gardens, glamour streets for shopping and small, picturesque ancient fishing villages. Mountain Geo-Trekking is the ideal excursion for discovering the unspoilt nature and landscape of the island of Ischia, exploring places of evolutional, geological and historical interest. A geologist and his staff run excursions allowing you to discover the natural features of Ischia, exploring the volcanic areas of the island and its thermal springs; in fact, the marvellous thermal springs, volcanoes, lava streams and fumaroles are all part of the natural underground forces which have over time influenced the natural features of the island of Ischia. This excursion includes a range of walks aimed at understanding the island and its close harmonious relationship with nature. When hiking, we put you in direct contact with the culture, nature, wealth, traditions, tastes and history of the Island of Ischia. During the excursions you will have the opportunity to learn about plants, flowers, fruits and their different uses; there are also visits to ancient wine cellars and traditional vineyards. You will learn about ancient crafts and artefacts of rural and historic buildings enabling you to understand the landscape of the island. The Aragon Castle is the symbol of the island of Ischia. To describe its beauty and historic value in writing is futile compared to a tour in person; however following is a short summary describing the layout, location and history of the castle. The castle is located on an islet connected by a 220m long bridge leading to the historic centre of Ischia Ponte. The castle is 113 high and extends over area of 56, 000 square metres, accessible either by a mule track or lift. The castle is mainly made up of ruins, churches, monasteries, abbeys, convents, prisons and also cultivated land. The first fortress was built in 474 B.C; over the centuries the fortress was at the centre of various wars and dominions, and home to royal families and celebrities such as Ariosto, Petrarca and Boccacio. The castle takes its name from the Aragon’s of Spain, who dominated this part of Italy in the 15th century. Tours of the castle follow 2 itineraries. West wing: Tours of the Terrazzo dell’Immacolata, which boasts breathtaking views overlooking Ischia Ponte and the Pescatori beach; the Santa Maria della Consolazine convent, Cimitero delle Monache, Belvedere del Convento, Cattedrale dell’Assunta and Cripta Gentilizia della Cattedrale. East wing: Tours of Casa del Sole, the San Pietro a Pantaniello church, the ancient wine cellars and cantinas, the Bourbon prison, Terrazzo degli ulivi, Santa Maria delle Grazie church, the ancient watchtower, Madonna della Libera church and also the panoramic loggia. Villa Arbusto is situated in the picturesque town of Lacco Ameno. In 1952 it was then purchased by film producer Angelo Rizzoli, who restored to villa to its ancient glory and landscaped spectacular gardens with rare plants originating from all over the world; standing out among the species is the colletia cruciata with unusual branches with flat thorns and small white flowers, and the jacaranda, considered amongst the 10 most beautiful flowering plants in the world. The villa, boasting a superb setting overlooking the sea, is today open to the public and also hosts numerous exhibitions, events and concerts especially in summer. When Villa Arbusto was being restored, the gardens were mainly off-limits however today are open to the public. Part of the villa is also small museum, Museo di Pithecusae (the original name of the island), with archaeological finds such as the famous Nestor’s cup, dating back to the 8th century B.C. The magical Island of Ischia is not only about sea and wellness, it has an important rural tradition which has roots deep till its origins. The island is famous all over the world also for its vineyards that produce prestigious wine and for its land products like spices, aromas and fruits, some of which are unique in the world. And regarding these special locations that we strongly recommend, it’s just about the combination of huge vineyards, amazing gardens, fragrant orchards with farm animals, joined to an eighteen-century aristocratic palace’s accommodation with Spa Centre and private chapel inside, all of that dressed by the sea at two steps of distance to create the receipt for the perfect event-vacation to live in a full immersion of nature, sea and…love. Inside this prestigious farmhouse it’s possible to live each day just like the farmer of that time but coddled by the most modern luxury, though living the location in total autonomy: it’s possible to take care of the farm animals, cook pizzas in the wood stove and delicious food based on typical receipts of the island with land products just gathered, enjoying the sunset walking in one of the vast vineyards among the summer breeze’s caresses and relaxing in the drowsiness of the water between hydromassage and chromotherapy. All of this means to capture and fully live the magical spirit of the island of Ischia and, if you are so lucky to succeed in that, I guarantee that you do not want to leave any more. The sea museum presents a short but fascinating journey discovering the marine history of the island of Ischia. Situated in the Clock’s Palace in the historic quarter of Ischia Ponte, the seven display rooms are situated on three floors, exhibiting traditional fisherman’s wear, ancient nautical and fishing equipment, old photographs and models of boats. The museum also hosts a section dedicated to the underwater world. The museum also preserves archive documents recording the marine and fishing events on the island of Ischia. Il Torrione (big tower), the ancient watchtower, is situated in the town of Forio. Built in 1480 to protect the town from Saracen invasions, the watchtower is the largest of seven towers which served to protect the town. Today the tower is a museum displaying the sculptures, poetry and portraits of local artist, Giovanni Maltese, who was born in 1852 and resided in the tower for a significant part of his lifetime. Ischia is also famous for its Spa gardens, set by the sea in a wide lush greenery of almost 6 acres including numerous thermal pools (some with hydro-massage) and seawater pools Numerous facilities are located within the gardens, including a Turkish bath, a health and beauty centre where aerosol and inhalation treatments are available, as well as pressure-therapy, massages and beauty treatments, all idealised for the regeneration of the body and mind. These gardens are also provided with private exclusive beaches and all the relative services. Here there are also bars and restaurants, with a choice of a more formal à la carte menu or self-service restaurant, both serving delicious, fresh island cuisine. Il Paradiso all'Improviso, Suddenly Paradise, is one of the many films shot on the island of Ischia, directors and producers drawn by its natural beauty and spectacular scenery and beaches. Ischia's beaches vary in size, from the long stretches of sand such as Maronti and Citara, and small coves such as Sorgeto, all set between its rock sculptures, sheltered grottoes and commanding promontories. Ischia's attraction lies in the diversity of its beaches and the influence of the volcanic earth underneath – at some spots creating darker, grainier sand, in others warmer water and steam baths. The larger beaches, like Citara, San Montano and Maronti - the latter stretching for almost three kilometres - are generally more easily accessible and provide extensive facilities for families. The smaller ones obviously provide more privacy where you can lay claim to a tanning rock or snorkel around the sea cliffs. The coves, accessible only by boat, recall tales of childhood adventures, of pirates and hidden treasure, as well as presenting romantic swimming holes. La Mortella, are certainly the most renowned botanical gardens in Ischia, situated in the town of Forio. The gardens are home to stunning and rare variations of plants and flowers, some native and many imported, and surrounded by lush greenery, intense fragrances and spectacular views overlooking Forio. La Mortella gardens occupy an area of over 25, 000 square metres and are composed of a valley garden and a hill garden. The gardens were created by the late Lady Susana Walton, the Argentinean wife of Sir William Walton, renowned British composer. William Walton proposed to Susana the very first time they met and moved on to Ischia shortly thereafter; the Waltons' spontaneous love has left a beautifully enduring legacy. During his lifetime Sir William's music earned him the highest English honour, the Order of Merit, while the late Lady Walton continued to enhance the gardens and managed the funds dedicated to her husband. The gardens are split into the “lower” garden and the “upper garden”. The lower garden was designed by English landscape architect Russell Page in 1956, the long axis formed by a thin rivulet of water. The short axis comes to an end directly in front of the house, Villa Walton, built by William and Susana in 1962. The main points of the visual axis are punctuated by four fountains, designed and developed by Lady Walton from 1983 onwards. While the lower garden is enveloping, intimate, humid, and luxurious, the upper garden is sunny, open, with stunning views overlooking Forio and cultivated with Mediterranean vegetation. The upper garden is punctuated by surprising architectural elements, many of which are ingrained with symbolic significance and references to the history and archaeology of the island of Ischia. During the summer season, the sounds of youth orchestras reverberate out from the newly created Greek theatre. Cooking courses and typical Mediterranean cuisine. The gastronomy of Ischia is based on fresh produce and simple, quality ingredients. Ischia is a garden bed of natural, rich flavours and fresh food deriving from its warm climate and mineral rich soil, providing the perfect combination for growing fruit and vegetables. Food plays a big part in Italian lifestyle and locals are finely tuned to subtle details like the glass of water offered at the bar to clean the palate before enjoying the coffee ritual, or the getting the right type of pasta to compliment the sauce. The cuisine in Ischia is closely linked with that of the Gulf of Naples; however with a few unique specialities, such as coniglio all'ischitana, local rabbit stewed in tomatoes, white wine, garlic and herbs; bucatini pasta (a long, tube pasta) is cooked to perfection and served with the sauce and the rabbit itself is usually served as a secondo piatto; a second course. Ischia's ancient fosse or ditches is an ancient technique for rabbit breeding, allowing the rabbits to grow in a controlled "wild" environment, predating our modern appetite and sensibility for free range food and ensures a tastier, better quality meat. Seafood and fish dishes are abundant and are used for appetizing starters, such as alici marinate, marinated fresh anchovies seasoned with garlic, chilli, olive oil and herbs or impeppata di cozze steamed mussels with pepper, or served with pasta dishes, such as the delicious spaghetti alle vongole, al dente spaghetti served with clams sautéed in garlic, olive, oil, parsley and sometimes chilli and a little tomato. Secondi piatti, are often main courses (followed by a pasta dish) of grilled dishes of seasonal local fish, especially swordfish and tuna in summer months, or meat dishes such as veal escalopes in white wine or quality steaks. On the sweet side, most of Ischia’s bars and cafés offer an array of tempting locally makes cakes and pastries, specialities including Sfogliatelle Napolitane, a filo-pastry filled with ricotta cream formed to a shell shape, and baba', a delicate sponge-cake soaked in rum. Along with the fine wine, Ischia's other drinks of choice are the strong after-dinner liqueurs, varying from the sweet Limoncello made from Ischia's tasty organic lemons, or the rather bitter Rucolino, a liquor made from rocket, which the Roman savoured for its aphrodisiac effects. Ischia also numerous sagre, or food festivals celebrating seasonal foods and produce, especially in summer months. The outdoor piazzas and streets are lined with stalls grilling and barbecuing the celebrated produce, from local sausages, mushrooms and swordfish, accompanied with wines. In September especially, there are wine-harvesting festivals all over the island, known as the Vendemmia, toasting the health of the grape and work well done. Good food and wine go with relaxation and enjoyment on the island of Ischia, where ancient recipes and traditions still prevail. 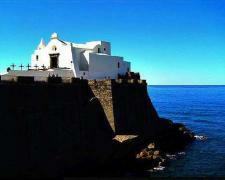 Ischia: new elite destination Ischia is a new tourist destination which for many aspects is undiscovered by mass-tourism. It is a perfect alcove of love and extraordinary venue for a really unique in a lifetime moment. Wedding Ceremony in Ischia An unforgettable experience in a magical atmosphere...that's Ischia! 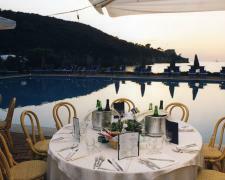 Wedding Reception in Ischia Charm, unpolluted sea and nature. Amazing scenery in the island of love!